This was way back in 1926-27. 1 had just started visiting the Trinity Club of Music. On one occasion I was surprised to see a person at the Club fully clad in Western dress. In those days one did not normally see a singer dressed like an Englishman. So I inquired in an undertone of a person sitting next to me, "Who is he?" He -whispered back sarcastically, "Oh! He is Deodhar. A disciple of Pandit Vishnu Digambar. He also calls himself 'Professor !" The man dressed in up-to-date Western clothes soon started singing and that gave me another shock. Whatever may have been told to me about this singer by my neighbour, I found that his singing was free from what was commonly described as Gwalior's Babashahi gayaki or simplistic style. On the contrary, I discovered that his singing was pleasing and contained a spark of originality. I really liked his performance and while returning from the club I deliberately sought his company and said, "You sang well." Apparently such praise was a bit of novelty to him. He looked at me in a friendly manner. I remember this incident as I look back on our close friendship of over half a century. I also remember that his inadequately developed performance on that occasion was a little away from the conventional rutted grooves. As our association and friendship grew I was able to see the various facets of his life, and career; and now I have no hesitation in saying that we have not seen in any other person of recent times an all-round and versatile musicologist of Deodhar's stature. It happened a year or two after our first meeting. By this time three Deshpandes and one Deodhar had formed an intimate group. Rangrao Deshpande, a law graduate and a singer-actor, used to play various roles in the plays staged by Hirabai Badodekar. A witty person with a sweet and sharp voice, well-versed in Urdu and Persian, Rangrao used to sing stage-songs, ghazals and kavvalis extremely well. The second Deshpande, Shankarrao (father of Suhasini Mulgaonkar) was M.A. and LL.B. and had received systematic training in music from Abdul Karim Khan. The third Deshpande was none other than myself and the fourth member of the group was Deodhar. All the four of us were singers, well-educated, and ambitious. While we were discussing things in general, Deodhar once said, "If I am to suffer from any disease, let it be so novel that it puzzles every physician." Here young Deodhar was indicating an important trait in his character which was to influence his entire later life. It should be noted that every one of us was well-educated and yet every one was wondering whether music should be accepted as a profession. In those days educated persons rarely entered the field of music. Rangrao, who was partly a lawyer, partly a singer and partly an actor, died in 1940 without making a final choice. Shankarrao was a teacher of music and although he continued his study of music, he started practicing as a lawyer at the Bombay High Court. After some years he gave up legal practice and started working as a broker on the stock exchange. Now he has completely withdrawn himself from music and is deeply involved in philosophy and spiritual pursuits. I became an Accountant and continue to be such. Deodhar alone, of our foursome, stuck to music and devoted himself to it. I now recall the name of one more person who was both educated and interested in music-Dr. Shrikrishna Ratanjankar. He was sent out by Pandit Bhatkhande to Lucknow to be the Principal of Marris College of Music, which Pandit Bhatkhande was instrumental in founding' Later, he became the Vice-Chancellor of Music University at Khiragarh. Dr. Ratanjankar's musical activities remained practically confined to Uttar Pradesh and Madhya Pradesh. Later, he became the Vice-Chancellor of Music University at Khairagarh. It has been Deodhar's determination to attempt something which normally nobody would dare to touch. Deodhar was the only one from amongst Pandit Paluskar's disciples who was permitted to matriculate while continuing his music education. 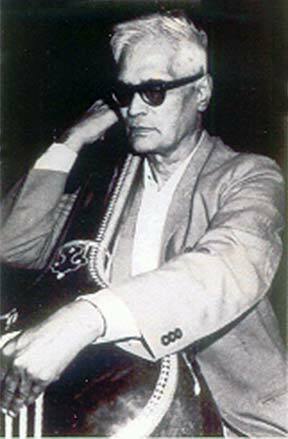 Deodhar alone was selected to learn Western music in addition to Hindustani music. Deodhar was the sole recipient of a scholarship of Rs. 100/- per month awarded to him by Dr. Skrinzi, the Italian Musicologist, then in Bombay. In the meantime, Deodhar managed to secure his B.A. degree. It was again Deodhar who was bent upon absorbing the influences of other styles of music; leaving aside his traditional Babashahi gayaki. (The word Babashahi is used by the followers of Gwalior gayaki themselves to describe their own gayaki. Babashahi means I old and unsophisticated). I used to tease Deodhar by saying that he changed his gurus every six months as one changed one's sandals. Before joining Panditji's Gandharva Mahavidyalaya Deodhar had received some training from Neelakanthbuwa Jangam, Abdul Karim Khansaheb and Vinayakrao Patwardhan. After being trained by Panditji Deodhar was also influenced by many more artists. These included vocalists of Agra gharana, Mohanrao Palekar of Jaipur gharana, Majeed Khan (the sarangi-player), Inayat Khan, Ganapatrao Dewaskar, Sadashivbuwa of Gokhale gharana, Shinde Khan of Gwalior gharana, sitarist Murad Khan and many more. But the lasting influence on Deodhar was that of Khansaheb Bade Gulam Ali Khan. Deodhar was deeply devoted to Bade Gulam Ali Khan and this devotion lasted till Deodhar's declining years. Deodhar is the only singer who, without receiving any systematic and regular instruction from any gharana or artist, was influenced by so many different traditions and collected musical compositions from them. If his performance is full of erudition and virtuosity today it is because he stands in the shadow of a long line of great singers. While learning from various eminent artists, Deodhar has amassed a large collection of musical compositions in various obscure ragas-compositions which are most attractive and beautifully put together. He will probably publish these compositions when the stars are favourable for their publication. I am sure Deodhar will ever remain a frontline artist in presenting different variants of ragas like Kanada or Todi or Nat one after the other in a concert. Deodhar alone can unravel and explain in an easy manner any unfamiliar and intricate raga. Although Deodhar has obtained musical compositions from various masters, he has done it without adopting their respective gayakis or styles. For inwardly he was a devotee of the style of Bade Gulam Ali Khan-that too without receiving any formal instruction from him. In Deodhar's singing of the bandish one can discern the influence of Shinde Khan but the style or gayaki would be that of Bade Gulam Ali Khan. Deodhar has, in effect, prepared his own style which is both novel and attractive. If you want to put my statement to test just ask him to sing a bandish-it will be distinctly of Shinde Khan style. But when Deodhar begins to unfold and develop the same bandish you will clearly see the influence of Bade Gulam Ali Khan. Since Deodhar never did become a professional concert-performer his independent style of singing failed to exert sufficient influence. Deodhar did not bother to master the concerts but his scholarship must be considered a birth characteristic. His grandfather, the famous Vishnu Shastri Deodhar was the guru of Narayan Shastri Marathe of Prajnya Pathashala of Wai. He was well versed in the ancient lore of Nyaya, Mimamsa and Vedanta. His father, two uncles and grandfather died in the plague epidemic when Deodhar was not more than 2-3 years old. It is indeed a miracle that Deodhar escaped death though he too was afflicted with the disease. While still a child Deodhar had the good fortune of listening to Abdul Karim Khan through the grace of Sakhdev brothers. He started singing through the streets of the town imitating Khansabeb's voice and gestures. In three successive years he met Pandit Vishnu Digambar Paluskar and every time Panditji asked him to stay with him and learn music. Deodhar was indeed lucky. From the age of seventeen till twenty-two Deodhar had the good fortune to stay with Panditji and the latter became the centre of Deodhar's devotion. Negotiating his way through difficult terrain Deodhar has had an almost obsessing urge to attempt something which no one has dared to do. During the last 18-20 years, he has absorbed himself in the subject of voice-culture, a subject which has not so for received any serious attention from any singer. And be has been experimenting voice-cultivation on himself and on any one else he can lay his hands on. It started this way. Deodhar once took Prof. Skrinzi to concert of Ramkrishnabuwa Vaze. The Professor did not like his voice and he showed his displeasure by remarking, "What kind of an artist is he? He does not even,know the primary voice-production. The one singer who can use his voice reasonably well is your Panditji." Dr. Skrinzi gifted a book on voice-culture to Deodhar and asked him to read it carefully. Deodhar happened to remember this book when he had already crossed fifty-five and started studying it. In order to pursue this subject further Deodhar went to America and studied this subject over a period of several months under the guidance of Prof. Ingam, who is an expert in voice-culture. (I call him 'Ingam Guruji'). I once said to Deodhar, in a lighter vein, "I will accept voice-culture as a science if you can improve the voice of my friend Prabhakar Padhye." Deodhar accepted the challenge and said, "I will certainly improve his voice. You may convey this to Padhye." In fact the two did really meet and fell in love with each -other. But Padhye did not find time to take lessons in voice-culture from Deodhar and consequently, so far as I was concerned, Deodhar had not established voice-culture as a science. But that was ten years ago. During the last ten years and especially in the last five years Deodhar's voice-culture technique has made considerable progress. A science is established through experimentation and this experimentation has to take place on a sufficiently large scale so that the conclusions drawn from it are accepted as valid by all. During the first ten years no one was interested in learning how one should use one's voice-apparatus. Deodhar had become a target of ridicule. Afterwards a woman singer learned voice-culture under Deodhar's directions but gave up the attempt after a few days. Thus discrediting poor Deodhar again I Then Ashok Ranade made a determined effort to cultivate his voice according to the science of voice-culture and under Deodhar's directions. There was a sea-change in Ranade's voice. This was a sign of hope for Deodhar and his science. Even today, those who know how Ranade previously regulated his voice will be able to see the improvement in his voice. Deodhar believes that Ranade should have continued the training a little longer. The third and the most important experiment is now in progress. This is with reference to Nirmala Gogat-e. It is only during the last five or six months that she has been receiving the training in voice-culture; but her faith in Deodhar and his science is unshakable. She is making efforts on her voice strictly according to Deodhar instructions. As a result there is considerable improvement in her voice and she gave ample evidence of this improvement in her performance in March, 1977 and again at Pune in November, 1977 -when she gave a concert at the Sawai Gandharva Music Festival. Since Nirmala Gogate is a performing artist there 'are many, who have heard her earlier performances. From their point of view, therefore, this noticeable improvement in her voice is a miracle. This is indeed an important landmark in the history of Hindustani classical music. Nirmalabai's attempts, though laudable, are still in the experimental stage. She should continue her training under Deodhar for a further period of six to twelve months. Deodhar himself believes that more such experiments need to be conducted. His mind is not Yet at peace. Any one who tries to do something novel, or attempts to break new ground is destined to face ridicule. After a period of some years, ridicule and sarcasm may subside and people may be prepared to consider these efforts dispassionately although doubts may linger in their minds. Then someone may come forward to submit himself to the experiment and when such experiments are repeated several times and with success, people might finally accept the technique as reliable. No innovator can escape this tortuous process. Deodhar has gone through and withstood the earlier phases. He is now definitely on the way to success in the 77th year of his life. There is one more thing of some importance. The main reason why Deodhar-'s voice-culture became a subject of common ridicule was Deodhar's own defective voice. He had decided to try voice culture on himself in the beginning till he could get some disciple willing to submit himself to the experiment. He would sit in front of a mirror, place the tanpura horizontally on his lap, place Ingam Guruji's book by his side and start the experiment. This funny sight was to be seen every day in the morning. I suggested to him, in a lighter vein, that a photograph of his in this posture might well be printed on the cover page of his autobiography! While training others in voice-culture, Deodhar has considerably improved his own voice and Mogubai Kurdikar once told me that she was pleased with Deodhar's transformed voice which she considered tuneful and without any blemish. This has led to one welcome development. There is now a realization among vocalists that there is a scientific way of cultivating one's voice. And as a result of this realization Deodhar has written a book on voice-culture. Publication of this book (The book was published in the year of 1979) will be an addition of an allied sub-science to the main body of the science of music. This will indeed be an unprecedented development in the world of music. If nobody is coming forward to undertake a task you can safely thrust it on Deodhar and feel a sense of total relief. This has happened many a time. Some enthusiastic members of Gandharva Mahavidyalaya started a monthly magazine Sangeet Kala Vihar entirely devoted to music. Within a year, having found the task too onerous, they promptly threw it on Deodhar's shoulders and went their way. I have personal knowledge of how much Deodhar has slogged continuously for the last twenty-five years to run this magazine. Deodhar, whose pen had never touched paper except for writing private and personal letters, soon developed into a seasoned writer. Once he assumed the responsibility of conducting the magazine month after month, he started writing biographies of famous vocalists as well as instrumentalists, histories of gharanas in music, articles on musical history and analysis. His writings during the last twenty-five years have been so voluminous, so varied and so weighty that the present writer's analytical book Gharandaj Gayaki would scarcely have been possible without their support. (There is in that book grateful acknowledgement to Deodhar). Some articles were selected from Deodhar's writings and published in 1966 entitled Thor Sangeetkar. The book has been widely appreciated. Deodhar's scattered writings of the last twenty-five years, first published in Sangeet Kala Vihar, have thus been brought together in a book form. The book acquaints the readers with the artists who were born in the 19th century, dominated the music world in the first half of the 20th century and who in a true sense were or are the representatives of the golden period of Indian music. The book also gives a detailed account of their contributions to art along with their pen-portraits. It constitutes important source material and an authentic reference book on the history of Hindustani music. The published book is the first part that would be followed by one or two more parts. Deodhar continues to write even at this age. It was natural and inevitable that his important writings should receive Government recognition and appreciation. He was the recipient of the First Prize awarded by the Government of Maharashtra in 1974. The second book of the same kind written by Deodhar in the evening of his life is the biography of Pandit Vishnu Digambar Paluskar. Although Panditji had done monumental work in the field of music there was no authoritative biography of him. This lacuna has now been removed and Deodhar has amply paid his debt of gratitude to his guru. He has not written this biography in blind faith and has not hesitated to lay bare the shortcomings as well as achievements of Panditji. It has drawn a proper and realistic picture of Panditji. The book is an important addition to biographical literature in the field of music. This is now available in Hindi translation as well. After Pandit Bhatkhande and Pandit Paluskar, nobody except Deodhar has conducted activities for the promotion of music. It was undoubtedly Vishnu Digambar who made music prestigious and the same mission was relentlessly carried on by Deodhar through meetings, lectures and music conferences. He has vociferously advocated the introduction of music in Universities from various platforms. He has been pleading for a place of respect for music in University curriculums. To achieve this objective he enlisted the support of leading figures in political, social and cultural fields like the Hon'ble M.R. Jayakar, Tatyasaheb Kelkar, Leelavati Munshi, Maharaja of Dharampur, Kanhaiyalal Vakil, etc. He carried his mission and message up to the Governor of Bombay. Leading English newspapers like The Times of India and The Bombay Chronicle also advocated introduction of music in Universities and championed the cause of music through their editorials. Deodhar had the good fortune to see that his efforts bore fruit. But Deodhar is honest enough to realize and admit that there is failure in this success. He gave expression to his disillusionment in his address at the Conference of Gandharva Mahavidyalaya convened at Jaipur in 1964. He said, "During the last many years I have been pleading for the introduction of music in our Universities. I have enlisted the support of influential personalities in my campaign. Now I feel that it would have been far better if I had not started this campaign at all. These Universities, Music Colleges and Music Schools, with all their curricula, have not produced a single competent artist during the last 30-40 years nor have they produced a single erudite musicologist. In order to produce genuine artists of calibre we must revive the ancient guru-shishya tradition." How many, in the evening of their lives, would have the courage and honesty to publicly confess their real sense of disappointment. In 1923 Pandit Vishnu Digambar Paluskar wound up his Gandharva Mahavidyalaya at Bombay and went to Nasik, leaving Bombay high and dry, musically. He returned to Bombay the next year and asked Deodhar, "What kind of disciples have you proved ? I thought that every disciple of mine would become a school of music! Why don't you yourself take it on ?" Panditji's message went home and inspired by it Deodhar started his School of Indian Music. The school has been working for the last fifty years. He has also turned the school into a public trust. Students who have received Deodhar's personal attention, instruction and guidance have been galore. He has never tried to put his pupils in the strait-jacket of his own gayaki. He has allowed his pupils to develop on the basis of their own natural endowments and he has supervised their growth after taking into account the quality of voice, attitude and potential of each pupil. In a sense, therefore, he has shown what an ideal guru ought to be. It is indeed very rare to come across a guru who allows his students full freedom to develop according to their own genius. Kumar Gandharva, who has evolved his independent gayaki, which was not even conceived by Deodhar, is a veritable living memorial to Deodhar. It is quite natural that Deodhar's pupils have not adopted "Deodhar's gayaki" but each one of them feels beholden to him. The fame of this versatile musicologist and great teacher transcended the boundaries of Maharashtra. The Banaras Hindu University persuaded him to accept on his own terms the Deanship of their Music Department for a period of five years, After the expiry of this period he was invited by the Banasthali University of Rajasthan to be the Principal of their Music Faculty. He stayed there for three years. Thinking that he would not be able to properly discharge these growing responsibilities at the advanced age of sixty-seven years, he returned to Bombay to settle down there. Institutions, students and accomplished artists here are all taking advantage of his return which was denied to them for eight long years of Deodhar's absence. After Pandit Paluskar's demise Narayanrao Khare,.Panditji's disciple and inmate of Mahatma Gandhi's Sabarmati Ashram, established the Gandharva Mahavidyalaya Mandal in 1931. During its first twenty-five years Deodhar was President of the Mandal and during this period the Mandal made remarkable progress. At an interval of every three years the Mandal has held Music Conferences of All India character, has convened Meetings of music teachers, has organized music concerts of famous artists and has honoured. eminent artists and musicologists by offering them addresses and shawls. Every sixth month the Mandal holds examinations for Visharad and Alankar degrees and diplomas and ten thousand examinees from every nook and corner of India appear at these examinations. Although the entire credit for these achievements cannot be given to Deodhar alone, it will not be denied that he has the lion's share in it. Deodhar has witnessed many ups and downs in his life. I have seen him hopelessly repaying debts of thousands of rupees incurred by him for floating a film company, a venture he had no business to undertake. He incurred the displeasure of All India Radio authorities for leading the Satyagraha of artists. Perhaps for the same reason State honours eluded him. But his musical achievements have been massive and they are so overwhelmingly great that his presence is inevitable and inescapable in any musical event or development in India. In view of this and in view of his services to the cause of music he was awarded the title Padmashree when he was seventy-five. With all this, utter lack of tidiness is an inseparable part of his personal life. He has a penchant for losing things and finding them again after a great deal of trouble. Family life of this uncommon musicologist has been competently managed. by his wife Champavati during this long period. Besides carrying out diligently her duties as a teacher in their school, she has also been quietly looking after the affairs of her husband. In Deodhar's absence she has looked after the management of the magazine Sangeet Kala Vihar. She had often to steer clear of her husband's lack of order and tidiness. Those who have been close to Deodhar are fully aware of the fact that Mrs. Deodhar has a very large share in her husband's achievements and success. After having said all this, it will be superfluous to say that Deodhar's devotion to music is uncompromising and complete. Music is the aim and purpose of his life. He has devoted his entire life to the promotion of the art and science of music and literature on music and has, for this purpose, traversed the Continent of Europe-visited France, Italy, Austria, England, Communist countries like Russia, Poland, Yugoslavia, etc., and countries in the Far East like Japan, Hong Kong, Philippines, Thailand, etc. He will be seventy-seven years of age on 1lth September, 1977 and I wish him all the best on this occasion. I wish Professor Deodhar and Mrs. Deodhar long life and fervently hope that he will produce further significant works-including his autobiography.